When Cité du design, Saint-Etienne launched its Collective Humancitizens Office of StÉtienne Experimentations in October 2015, a group of stakeholders of Cret de Roch district decided to answer the call and launch labs to experiment the transformations of the “hidden face” of the district, around Neyron street. They are designers, former architect very involved in the community and popular education associations, artists, gardener, managers of associations in charge of social economy (creation of new services in vacant premises , upcycling and repair economy, services between neighbours)… For more than 10 years, they all have taken part in the activities which give a new dynamic to this popular district on a hill : on the lower part, at the edge of city center ; on the top where residents have set up community gardens… but what about the middle part ? The Neyron street is a bit forgotten, crossed by the cars, with several brownfields. It will be the object of urban renovations by the urban planning agency. How to imagine the evolutions of this area within the time ? How to involve the inhabitants in these transformations ? How to imagine the future without planning heavy structures, but whether reversible interventions adapted to the evolutive uses of the spaces by the inhabitants ? How to enable inhabitants to be creative actors of the transformations of their district, whether than worried spectators ? 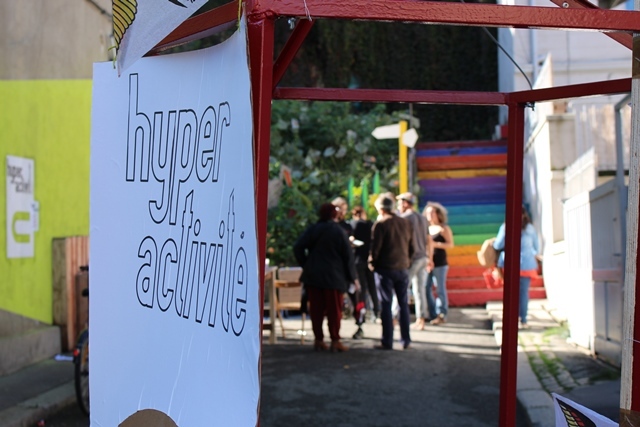 Hypermatière multidisciplinary was set up to offers mobile, evolutive, reversible and recyclable interventions to experiment the various temporalities linked to the uses that accompany the development of a changing neighbourhood. 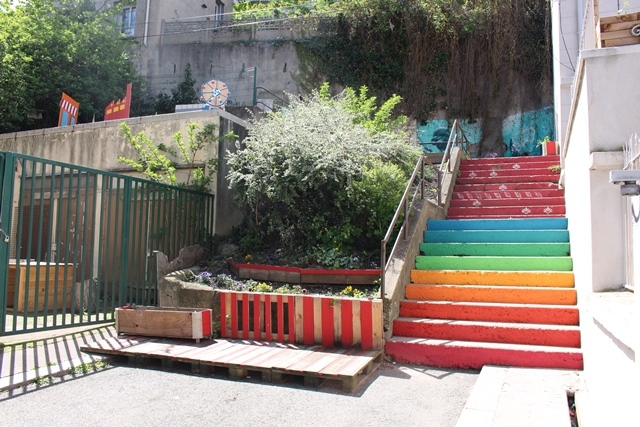 It began with small actions : painting the stairs and planting flowers in a passage crossing the hill with the children of the district, to make it more convivial and reveal this spaces. Collecting the wild fauna of the brownfields and printing them on ceramic tiles. The urban planning agency gave the group premises in a vacant building to make their activities. From there, the group organized several workshops in July and October 2016, urban walks to discover the district … . Each activity is an opportunity to reach the inhabitants and question them on their perception and ideas about the district . Which are its distinctive features ? which kind of services or facilities would they need to make it more alive ? These workshops were also a way of gathering the various associations of the neighbourhood in oder to transfer their collective dynamic to this area. The next step : a collaborative construction work from 27th February to 7th March 2017 on the major brownfield of the street, with students of a professional highschool and Saint-Etienne school of Art design, volunteers from the neighbourhood and the city, to build a micro-architecture and set-up some green area. It will create a temporary public space to welcome numerous workshops and conversations during the Biennale Internationale Saint-Etienne 2017. It will show the process and the relevance of these contributing practices. These workshops take partly place during the 10e Biennale Internationale Design Saint-Etienne within the frame of Human Cities_Challenging the City Scale/ Saint-Etienne 2017. 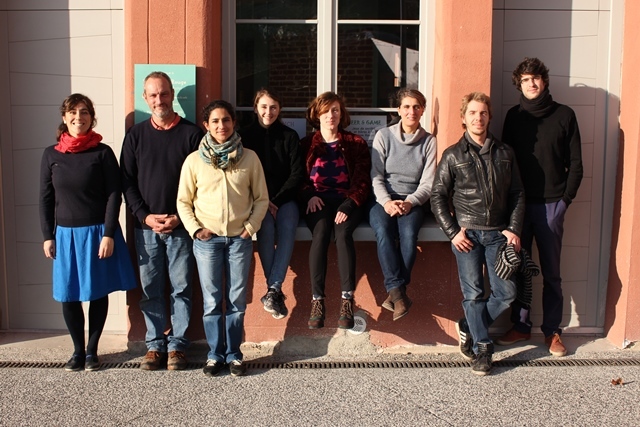 More info about its programme and activities you can find here in FR and EN.